With snow and bitter winds. It was warm last week, and I thought of spring in Illinois, where I lived for 4 years, after living in Minnesota. Spring came in February there, in Illinois. Tornado alley. That's what they call it. When you live in Minnesota and Illinois you listen to the weather. You keep emergency supplies and you know in which corner of your basement you will cower when the big wind approaches. My son in Erie, PA, said there is no snow there. "Wait, let me look. None. No snow." My son in Portland, ME, said, "We got a little hail the other day, that's all." We got 6 inches of heavy wet snow. My scapulae ache from the effort of pushing it around. Like wet laundry. I scooped my driveway at 10 pm, while it was snowing large flakes. In the night, the town snowplow pushed a wall of boulders into my wide driveway. It's wide enough for 3 cars. I scooped and pushed it around, knowing if I left any my neighbors would feel compelled to tidy up after me. I scooped well and was satisfied with my effort. It was clean and good. When I went to the grocery store my neighbor came and tidied up. Today was sunny with a cold wind. The daffodil shoots are buried again, discouraged, wishing they lived in Illinois. Finished it. Whew. Read it on my nook. Slow start. I thought, "Do I really want to read this? It's so dark. Cold, violent, claustrophobic, and depressing. Haunted. The rustic dialect. But it's a classic, I argued with myself. A free download. It's supposed to be good. Just try it again." So I slogged on. What a chore, I told myself. But really, every time I opened the book I got hooked in the first sentence and read til my eyes burned and my spine sunk into the mattress. The mystery is, why this book? Why a book so old, the author so unlikely in so many ways (google her), why is this book still powerful? The themes are contemporary: abuse, revenge, obsession, and love. The story within a story. The different perspectives. The rich and powerful screwing the weak and innocent. All still compelling and meaningful today. So, maybe read it again. What? You never, well, def! Give it a try. 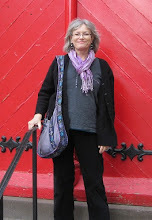 I've just read a new title: Reiki practitioner/Reiki teacher. I like that so much better than master. I never felt like a master. I feel more like a student. There's so much to learn! I'm always learning and evolving. So I give up "master"; I like practitioner/teacher. Thank you, Komyo Reiki Kai New York and INAMOTO Hyakuten Sensei. Went to a Reiki Share this evening. It was held at a private home, a beautiful home, way out in the woods. I say beautiful, and it was like a palace or a magazine house. It was new, clean, and full of art, books, and technology. A palace. I arrived at sunset, so got to see the display of glass illuminated by the setting sun. Glass, prints, photos, fiber art, stone carvings, baskets, a starburst in the parquet floor, and even a glass chimney. Ever seen a glass chimney? There was a wall of windows, skylights, and twinkling candles everywhere. We ate vegetable stew with pasta, sourdough bread, and a spicy salad. We talked about Reiki and hospice. Then we climbed up the spiral staircase to the Reiki room. I guess I haven't shared Reiki in a while. I do self-Reiki every day, of course. This was different. I felt my guide, angel, and grandma. I hadn't said hello to them in too long. They were with me tonight. Other spirits too, lots of them. We shared Reiki. I did cave breathing, and felt time slip away. I opened my eyes to check the client and my hand placement. I could see fish in the aquarium down on the first floor, floating up and down like confused balloons. There was a piece of art, representing the life of a person. In the beginning was an exuberant swirl of energy, next a star or compass- finding one's direction, and then the end: a quiet circle of reflection. It was detailed and precise; it incorporated many natural elements like stones, shells, and shark's teeth from a Saudi desert. Then it was time to leave. I knew Fluff was lonely; I had to get home. I stepped outside and looked up. So many stars. I've missed the stars, there in the city. I found Orion, and searched for Pleiades. Couldn't leave til I found Pleiades. I looked, my head tipped all the way back, swaying a little, not feeling cold at all, looking through the bare branches: found it! A sense of peace, my home constellation. Pleiades. Jumped in the car, turned on Myrtle, my GPS, and headed out in the dark. Frost heaves bubbled up in the road, jouncing my ride. I turned on the brights; dimmed again for oncoming traffic. So dark, no landmarks, but Myrtle got me home. Fluff was some glad to see me. I patted her and found another lipoma. Tomorrow: predictions for 3-5 inches of snow. February in Maine. Reiki share way out in the woods in a Renaissance palace with optimistic people who earn their living honestly, in a way that benefits others. I'm going to a Reiki share soon, bringing a chocolate pie. Potluck first, then Reiki. A gathering of optimistic people, grateful for small things like knowing each other. Dark comes early and stays late. The air is cold and dry. Turn down the heat, 58 or 60. Crank up the electric blanket. Wuthering Heights is really good. I'm reading it on a nook tablet. I don't want to ruin it for you, but a main character just died. It's spring break, Feb vacation, and President's Day. The students are off for the week, several teachers took the week off too, and DHHS across the street was closed. So it was a quiet day at work. I graded papers all day, and it took me all day. Tomorrow I will work on lectures: streamline, cut out excess, and build in more small group activities. Tomorrow we're having a potluck at work, a turkey dinner. There will be roast turkey, cranberry sauce, green bean casserole, mashed potatoes, and rolls. I made 2 chocolate pies. Chocolate fudge, not pudding. Rich dense chocolate fudge pies. Lots of teachers are soaking up sun. One went to Florida, one to Cancun, and a Caribbean cruise for another. It was sunny here today. But the wind was strong, and bitterly cold. The backyard is one quarter frozen grass, and three quarters pockmarked ice. There's more grass every day. Subzero temps are predicted for tonight. Everywhere you look it's grey and brown. I'm thinking of turquoise water, blazing sun, and white sand. what makes a great Reiki practitioner? of the qualities of an excellent Reiki practitioner: great communication skills, highest ethics, knowledge of Reiki history, compassion, ability to distinguish between Reiki and other modalities, and ability to maintain professional boundaries; in your opinion, which is most important? Sat on the deck, in the sun, 35 degrees F, while Fluff patrolled the estate. A flock of small songbirds landed in a tree and reminded me of summer songs. What kind of bird? I don't know. Do you? They were small songbirds. Like miniature robins, pretty sparrows, maybe a brand new type of bird. They had brown backs, creamy breasts, and pinky-orange necks. They sang complicated songs about worms, heat, and flowers. They flew off in a rush, things to do, seeds to seek. Just took an online test. Eighty percent of those who score over 32, I think it was, have Asperger's syndrome. I scored much less than 32. Not Asperger's. Took an IQ test; I am not a genius. Took the Meyers-Briggs and am the rare INFJ, a sensitve intuitive introvert. Famous INFJs are Nelson Mandala and Mother Teresa. Really? Thought I was a little more Lady Gaga. hmm. Fluffernutter. 13 years old. Not sure today is really the day, but it's the day we celebrate. I remember that 2 day-old puppy I held in my hand. I remember the farm where you were born, up there in the woods near the mountain. There were dogs, cats, cattle, and horses. A baby too. Rough people, rugged; life was hard. Now your life is quiet and slow. You sleep a lot. But tomorrow's a new day and we'll go exploring. is slow going. I make myself read it. It's good for me, right? But I dread it. The cold, darkness, and violence. Why do we do things we don't really want to do? Are they really that good for us? We go to the gym, spend time with people who drain us, go to office parties, and eat vegetables. Why do we do these things? Oh. Turns out those things really are good for us. k. See ya at the office party, I'm bringing the vegie tray. We need them, am I right? I drive to work at 6 am; it's icy and dark. There are 8 lights on my way to work and hardly any traffic. So why, why does the light turn red as I approach? There's no one else around. Why does it randomly turn red? Red for me, green for no one. Smart lights. They read traffic patterns. Stay green for traffic flow, adjust to volume. That's what we need: smart lights. You know, from the health food stores. Tall plastic bottle, lots of writing that you always mean to but never have time to read. Grabbed a bottle. Amber orange label: citrusy. Ginger-orange. Orange-sandalwood, ummm, wouldn't that be nice? Yeah. It's tea tree-hemp. I got in the shower, squirted out a hefty handful and, oh. Turpentine. I smell like turpentine. Well isn't that refreshing? Went to a Reiki share tonight and it was wonderful. There were 12 of us: all levels, all walks of life, all committed to Reiki and health. Old members embraced and we welcomed several new members. 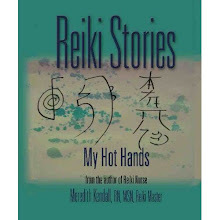 We talked about Reiki, and how we practice. Most of us practice daily self-Reiki, Reiki on pets and loved ones. We broke into 3 groups of 4. We have only one Reiki table, so 2 groups did chair Reiki. I was in one of the chair groups. First we did a Sufi breathing exercise. I felt so grounded. It felt like my busy spinning frantic life settled down into the calming energy of Gaia. I was transmuted. My breathing changed, my thoughts spiraled down into a peaceful puddle. We joined hands and recited the Reiki principles. I took up the floor position. I like to sit on the floor. So I worked on knees, shins, ankles, and feet. The Reiki energy pulsed through my body. I felt the heat. I cracked open my eyelids to check the client. He was grinning. He looked blissfully relaxed. Afterwards he said that the pain in his knee disappeared 10 seconds after I placed my hand there. I could hear the group in the next room. They were whispering. Someone came in our room to grab some tissues. Someone was crying. The lights were dim and it reminded me of a slumber party or a Reiki retreat. We moved on to another recipient. Again, we held hands and recited the Reiki principles. We reviewed the symbols. I placed a hand on each knee. I asked to be guided by love and wisdom. My whole body throbbed with the energy. I checked the client's face. She looked placid, benign, relaxed. I continued down towards her ankles. I could feel the heat. I asked for her best health. Afterwards we all gathered. There was a big brown teddy bear, probably 2 1/2 feet tall, super soft: irresistibly huggable. We passed it around. We shared our impressions, visions, and hopes. There were new connections, promises of future gatherings, and gratitude for what was. I'm raising money. It's for a great cause. Click here! Your donation helps to provide free support services for people whose lives have been touched by cancer. Cancer. Such a random event; a cell mutates and grows. Lives change. People need help. Families need help. So please help. Your donation helps to provide Reiki, massage, financial counseling, spa services, hugs, hats, and strong shoulders. When you click on this link you can simply make a donation. Or you can click here to purchase a book. All my profits from these sales are donated to support services for people with cancer. Please give. Your support will change lives.Your click makes a difference. Fluff has this annoying new habit. She likes to get up at 2 am. Some of us need our beauty rest. Well, not her. She always looks fab. She jumps off the bed and stands there. Gak. Prob has to pee, am I right? I get up, let her out, and go back to bed. I fall asleep for 5 minutes. Maybe 10. Get up, let her back in. Inexplicably have to lift her back onto the bed, like for some reason she can't jump back up and I am further reawakened. Is diphenhydramine appropriate for dogs? Tylenol Lassie PM? Reading it on the new nook. Classics are free! So. WH. Your opinion, please, dear reader. 2) Ghosts and violence, cool! 3) Drama of dysfunctional family. Melodrama, actually. Saw this video today. Please watch and share. Feel so lucky- I get to work with the coolest people. Nurses- who could be better? Our goal is to make your life better. It's almost spring. From earnest eager adults: biologists, lifeguards, moms, cooks, and soldiers; through bedpans, wounds, gowns, textbooks, injections, and computers... nurses emerge. I walked around Portland yesterday. The sun was shining but it lent little warmth. An arctic air mass hovered overhead, and a bitter wind blasted. I kept tucking my scarf around my chin; I kept my gloved hands in my coat pockets. I pretended the sunshine was warm, but didn't linger on the streets. I walked quickly, glancing in shop windows and up at the big blue sky. There was a cupcake shop. A pink cake was painted on the window, and there were glass stands of lavishly decorated cakes. The glass reflected rainbows of light. I pushed the old door and walked inside. A couple looked up and stared at me. The place was techno bare. A chic girl stood at the counter. She had short dark hair, pallid skin, skinny arms, and a low scooped top. There was a thermos of coffee. "Is that regular?" I asked. I smiled. "Oh. Do you have decaf?" I looked at the choices. Red velvet, lemon, spice, and chocolate with caramel salt. I ordered the chocolate and went to the bar in front of the window. I yanked at the tall chair. It was unexpectedly light: brushed aluminum. The bar was an old barn board, black, polished smooth. I sat and ate as Valentine's couples giggled by out on the sunny sidewalk, matching outfits, arm in arm. Currer asked me to send Reiki to our friend Acton. "I know you're busy," Currer wrote. "But Acton is not in a good place. Please send him some Reiki. Please help if you can." Of course. I'm busy, but never too busy for Reiki. Took the dog out. Sat on the deck in the cool evening air. Birds flew overhead. Lots of birds. After a few minutes I decided to count them. I quickly counted a batch in the sky: 20. With that visual, I started estimating batches of 20. They flew against the cold grey clouds, spreading out and coming together in waves and patterns. They reminded me of stars, or snowflakes. It seemed like a batch of twenty went over my head about every second. They made a cawing noise. I tried, but couldn't hear the flapping of their wings. The numbers piled up by the hundreds. A thousand. I had damp hair from my shower and started to feel cold. I kept counting. The dog snuffed the snow and wandered around the yard. Another thousand. I headed to the door: head up, still counting. Twenty-two hundred. Two thousand two hundred black birds flew in the sky. at the library... cool write up in the newsletter. Please join us. I'd love to meet you. we creak, groan, mumble, and stagger from winter to spring; shedding trails of wrappings: hats, jackets, and gloves. One day it's all arctic blasts, icicles, and whirling flakes. The next, bright sun and puddles of melt. One day your nostrils freeze closed, the next you see bare grass at the edges. So we toss off scarves and look for robins. Sun, smiles, and signs of spring. The theory is... cancer starts when a cell mutates. Why does it mutate? We don't know. Could be an environmental toxin, a genetic defect, trauma, viral... we don't know. Anyway, it mutates. Then maybe it will die. That's good. Or maybe it lives and multiplies; that's bad. Maybe it grows, develops a blood supply, and grows more. It presses on the tissues around it causing pain and problems. Maybe it gets into the bloodstream or lymph system and spreads to another location. That's metastasis. In the new location it starts to grow, develops a blood supply, and grows more. More problems. That's cancer. What are the medical treatments? Surgery, chemotherapy, and radiation. What does a person with cancer look like? They look like themselves. As nurses we work with the patient to help figure out his or her path to optimal health. Then we help them along their path; we do whatever we can to help the patient achieve his or her best health. Sometimes Reiki is a nursing intervention for the person with cancer. Reiki can help reduce stress and pain, and increase a sense of empowerment. The person with cancer may be able to relax and sleep better after a Reiki session. I planned a day trip to Farmington. Woke up and the sky was heavy and grey. Looked like snow. Snow was not predicted, partial sun was predicted. I got ready to leave. I looked out the window; it was snowing. Big lazy flakes disgorged from the low sky. It piled up. I despaired. I checked weather sites online: cold, partial sun. I waited for the snow. It stopped. I quick-scooped the driveway and jumped into the car with the dog. Off we went. I stopped for gift loaves of bread and coffee for myself. OK, truth. I got a chocolate raspberry danish too. Hey, it's the Crack Shack, what do you expect? You may be addicted to kale and ginger, you stop here you will find new addictions. North, no sign of new snow. All sun. I stopped to wash the car. Put on my sunglasses. Cranked up the radio. I love those weekend road trips. PS: way too easy to buy books on nook. Oh yes, found Anne Patchett's State of Wonder for my nook. Found my books too. Cool! Yeah, I'm hooked on electronic devices. My little netbook is my fav. Love public radio. Am glued to desktop - office days at work. Rarely use phone, no TV. Wonder how much I'll use this nook. Bought a nook tablet last weekend. Wasn't sure I wanted it. Was assured that had 15 days to return it. It stayed in the bag. I'm way too busy, not enough hours, etc. Last night I took the bag to bed with me. Took the nook out of the bag. Took a deep breath, opened the box. Today I charged it up. I went to the library and saw a book I want to read, by Anne Patchett. This evening I signed on. I like it, perhaps I'll keep it. Wait, just searched for that Anne Patchett book and they don't have it. hmmm. Bought it. Still in the bag, in the box. I need more hours in the day. I bought it so I can read books without adding pounds of paper, stacks of books to my stacks of books. An ethereal library sounds good. I live in a tiny house. I do have piles of books, and I've read them all, but when I search it's usually online, not in a book. I'm so digital. So. Much as I love paper and print, as reluctantly as I drag myself to the future, I think I will make the switch. Face it. My favorite place to read is the bathtub, and there is no tub in this house. Face it: nook. Now: open that bag and say hello to the future.